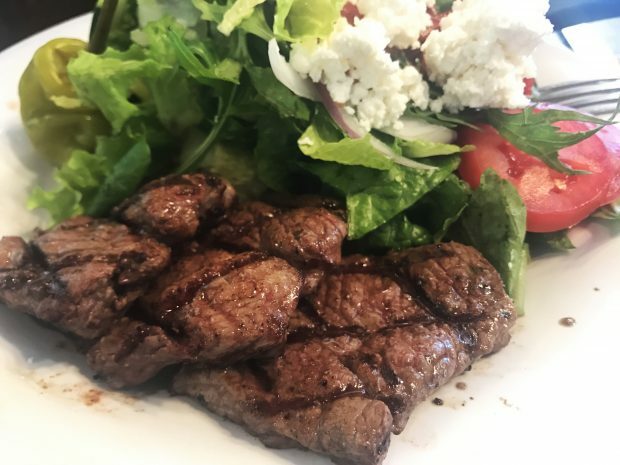 Eating Paleo at Taziki's Mediterranean Cafe - Oh Snap! Let's Eat! One of the reasons I go there so often? Because it’s easy to to eat healthy and (pretty) paleo there. Some paleo options there include the Salads and the Feasts. The Feasts… mmmmmm, okay, now I’m hungry and I’m not sure why I decided to write this before I eat dinner. I can tolerate some dairy, so I have it there. However, if you’re not, obviously ask for it without. 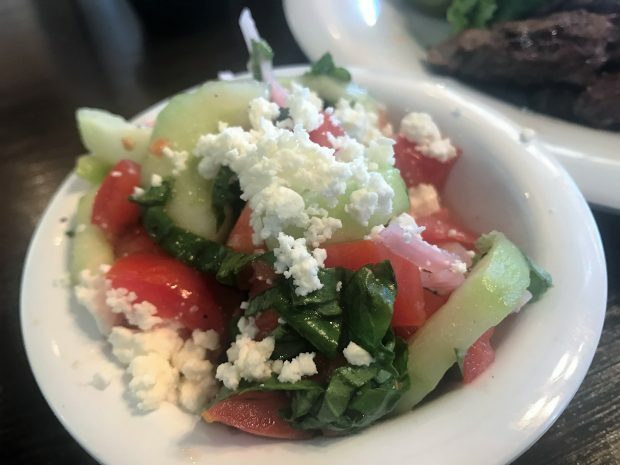 It also comes with a Greek salad, and a choice of a side (which they say either basmati rice or roasted new potatoes), but I actually ask for the Tomato Cucumber Salad because 1) I love it, it’s so delish, and 2) more paleo than rice, and less carby than potatoes. Though I won’t lie, when I’m starving my face off – it’s potatoes I go for. Did the Feast sound like way too much food for you? You can try getting the salad! You can choose Greek or Mediterranean, and your preferred meat/seafood. Grilled Chicken, Turkey Breast, Beef, Grilled Lamb, Tilapia, Shrimp, and Salmon are all options there. Does it all sound delicious? It does to me right now, especially because I’m pre-dinner mode over here. Here’s the menu (you have to choose a location first) if you want to check it out. Oh, and they have a Nutritional info page for ya’ll out there counting calories, carbs, or whatever. So anyway, have you eaten there? What do you get? I would have to say that this place is on our top 3 places to eat nowadays. Likely #1 to be honest. The salads are amazing and all the meats and fish are cooked on the spot and to order. Amazing healthy food. Just one caution, if you are counting your calories look for alternatives on the dressing and seasoning. Some may have a lot more Calories than you may expect. I skip the balsamic on the Mediterranean Salad, and it’s still amazing without it. 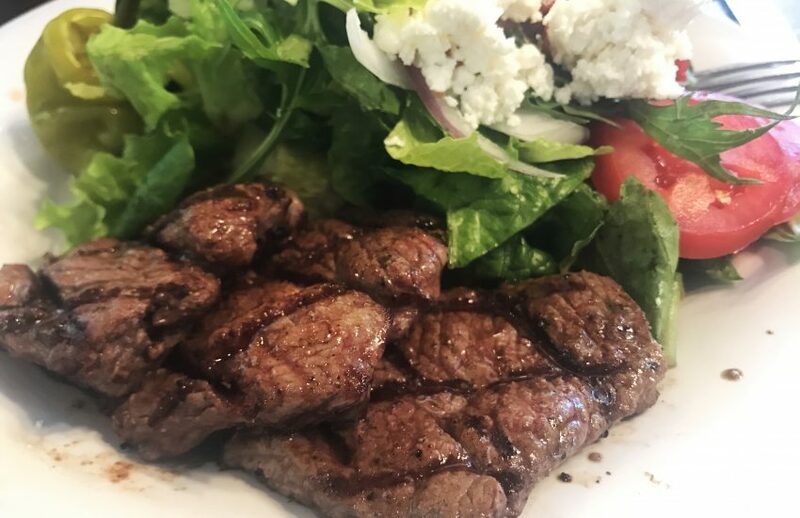 My wife loves the beef tenderloin with her Med salad. Charlotte is home so we go there at least one to two days a week. Oh, the service, OMG! Best folks at any eatery by a long shot. Extremely pleasant and so service oriented. This place is filling the void so needed in eateries today! Enjoy!! !